Some work on installing a new deck for the summer. Others – it is working on a painting. For me, it’s building a 20-odd layer lasagne. Yes. You read that right – 20+ layers of noodle-y goodness packed into a casserole dish. The mothership was having her regular pals over for the time-honoured traditional game that involves pushing ceramic tiles around a square board and clucking on about their lives. And it was my Spoonerly duties to provide sustenance for their day-long gab fest. I usually take this opportunity to make something special – it is not that often that I am able to execute a full menu – starter-main-dessert, and I usually provide a snack (and sometimes) and lunch for the ladies – so it’s a day of work for this Spoon! I was inspired by a post on the Kitchn website featuring a 100-layer lasagne (at a New York restaurant). 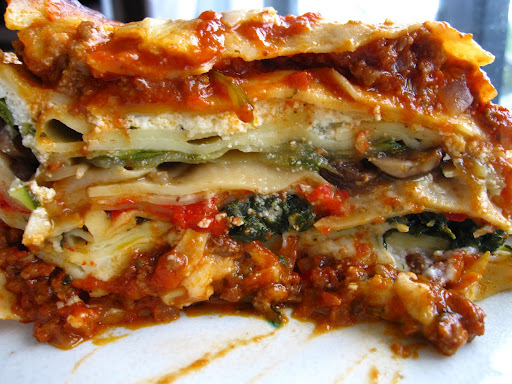 There was no way I was going to be able to make a 100-layer lasagne, but 20? I could do that. Store-accessible noodles are much too thick for this project. You need thin enough noodles that it won’t overwhelm the fillings and sauce – the only way to do this is to crank them out yourself. What kind of sauces are you going to use? Marinara-cheese only? Meat sauce? 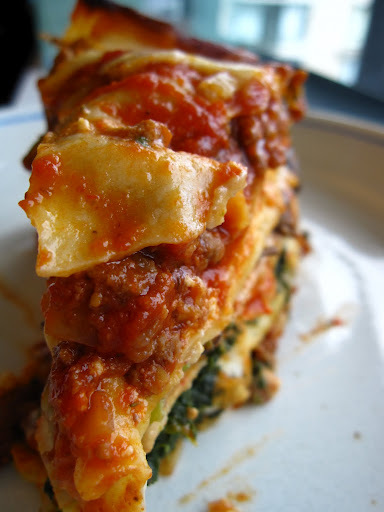 I decided to go with different fillings for almost every layer (repeated with ricotta, meat sauce and marinara). Obviously – you can go store-bought all the way, I went with only the tomato sauce being purchased but everything else being prepared. Step 4 – Cook your noodles! I tried the whole ‘no cook’ noodle thing – didn’t like it. Lay everything out strategically. I suggest noodles on one side and all your fillings at arms reach around the other side. Keep a paring knife handy in case you need to trim any noodles (if homemade). Lots of spoons. Lots. I would also highly recommend writing out the order of your fillings to keep organized. In selecting an appropriate pan – DEPTH is as important as width/length. I cannot stress enough the importance of cooling your lasagne. Cut in it too soon after taking it out of the oven and it will literally “break” – your fillings will slip ‘n slide and any excess moisture will pool, making each portion a sloppy mess. 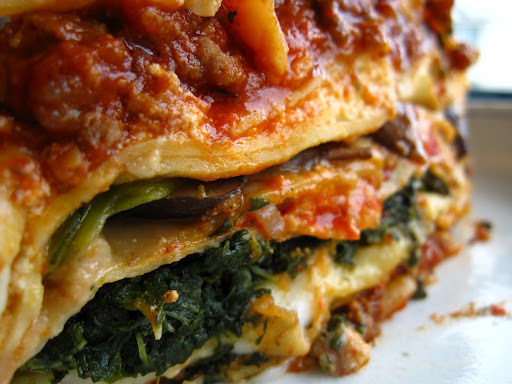 Step 7 – Step back and take in the glory, that is your lasagne! *yes, I baked it in a round casserole – I didn’t have a deep enough rectangular/square dish, so everyone got a ‘slice’ of lasagne! Believe it or not, I forgot a couple of fillings! (pesto and pulled pork) I also had enough noodles and leftover sauce to make a mini-lasagne in a loaf pan. After this, I don’t think I’ll be attempting a 100-layer project. All I can say is: can I have a piece?